A BIG question we often get is “What is Hydrotherapy💦” and is it the same as Aqua aerobics? Hydrotherapy💦 is the use of water-based therapy for rehabilitation and exercise and can be referred to as Hydro💦 for short. 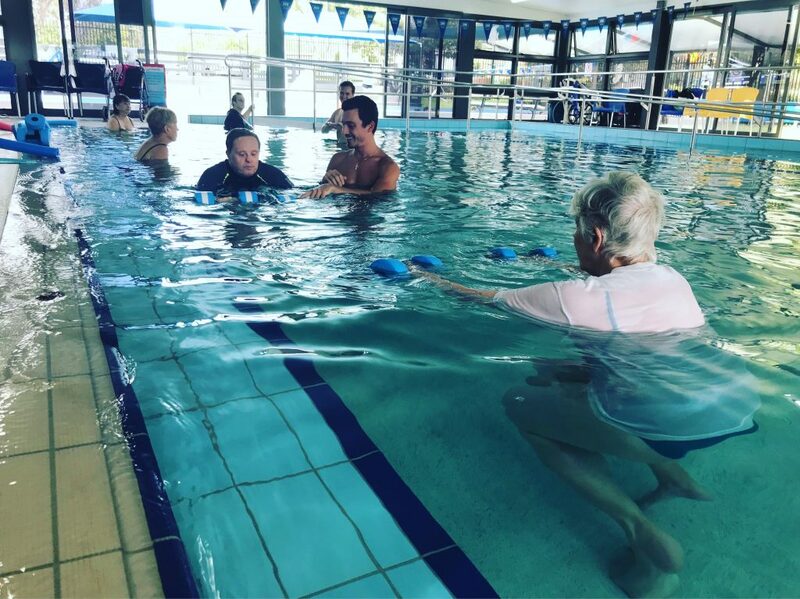 Hydro💦 is performed in a warm water pool (30 degrees) with a normal ramp, step & specialised wheelchair & hoist access while Aqua Aerobics is performed in the standard pool. The aim of Hydro💦 is for you to achieve exercises and movements, that are low impact for the joints and to assist with increasing strength and range of motion. What are the 8 KEY benefits? The warmth of the water relaxes muscular spasm which is commonly found in close proximity to the area of pain. Vasodilation, which is the widening of blood vessels, also helps in increasing circulation in the area of discomfort which ultimately helps in accelerating the healing process. Hydrotherapy💦 can help strengthen weak muscles. Different exercises in water and the type of exercise prescribed will vary according to the condition or injury being treated. The resistance provided by the water itself helps to strengthen weak muscles. Exercises can be progressed by increasing the speed of movement or by increasing surface area by introducing various special forms of floats. The increased temperature of the water helps in relaxing tight muscles with the result being an increased range of movement of any particular joint. This will help you to feel more mobile and flexible. Physical fitness can be described as a measure of the body’s ability to function in an efficient and effective manner during daily activities without fatigue. This can be achieved through appropriate nutrition, sufficient moderate to high-intensity exercise and adequate amounts of rest. Exercising within a Hydro 💦 pool can help in achieving your goal of being physically fit in a safe, professional and enjoyable environment. A Hydro💦 pool provides the opportunity to exercise without your bones and muscles being shackled by gravity’s constraints. Therefore, hydrotherapy💦 conveniently provides a gateway to exercise in certain conditions were a constant ground impact is too painful or not indicated. Exercising in warm water helps the body to release several hormones that contribute towards feeling energised and less fatigued. Research is also showing that exercising in warm water may also aid in alleviating symptoms of anxiety and depression. Water is a moving body. This makes it a very useful tool to challenge and retrain balance, with the ultimate benefit of reducing the risk of falls. All the above-mentioned benefits can only be experienced if the right venue is chosen. The purposely built, state of the art Hydrotherapy pool at Mudgeeraba Aquatic Centre boasts of a unique design. Access to the pool by means of a shallow ramp together with a manual hoist which is available on site makes it accessible to anyone irrespective of one’s level of physical and functional mobility. Different pool depths and a multitude of floats and equipment available make it arguably the best possible hydrotherapy pool to exercise in. Showering and changing facilities are also available on site together with free parking. Are there any contraindications to hydrotherapy💦? So, WHERE, WHEN & HOW MUCH? At the Mudgeeraba Aquatic Centre, School Street, Mudgeeraba, 4217.